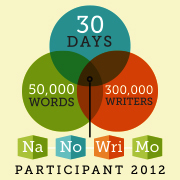 On midnight 30 November, NaNoWriMo 2012 ended. I wish I could report that I 'won' and wrote the full 50,000 word novella. But I didn't. To be honest, I barely wrote anything in the last week. I got wrapped up in other aspects of my life and dragging myself to the computer to type away had lost every ounce of appeal. Instead of feeling guilty about this, as I usually would, I felt rather calm. It didn't matter that I hadn't succeeded first time. To be honest, it would have been a minor miracle if I had. I had given it a damn good try and most importantly, by trying I had learnt a lot. I learnt that to write well I need to be in the mood. And if I think of a good sentence or phrase I should note it down immediately. I learnt that writing takes a damn long time and you need to force yourself to stay at your desk and think and type. I learnt what I already suspected – that writing something funny is one of the greatest challenges. I learnt that I really would like to give this a go and so I am happy to report that I have been slowly typing away at my 'novel' since the month finished and one day I might even reach the mythical 50,000. I reckon that's pretty good for a first go. Yay me.